Franklin Delano Roosevelt High School was built as part of a Depression-era pubic works program in 1941 and owns the rare distinction of being named for a sitting President. Today, the school serves 1,550 students in Hyde Park, NY, FDR’s hometown. Although the original high school building is in the National Register of Historic Places, growth prompted the construction of a larger building long ago, and the school continues to maintain up-to-date facilities. When its athletic field aged beyond useful repair, the school board ordered it razed. 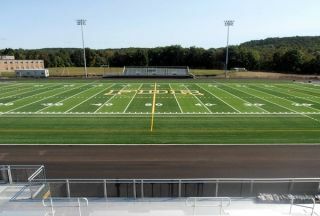 Built on the same land, FDR’s new athletic stadium boasts a cutting-edge sound reinforcement system, with power and digital signal processing both provided by the high-efficiency, cost-effective Ashly nXp3.04 high-output power amplifier with on-board Protea processor. Dominick Campana, owner at Pro Sound Associates (Guilderland, New York), led the system’s design and installation, and Live Sound, Inc. (Troy, New York) served as the sound system vendor. Inputs to the system include four Shure ULX-series wireless microphones, three hardwired microphone jacks, and a Tascam CD-200i combination, aux in, iPod, and CD player. They feed a Shure SCM810 9x1 automixer, which in turn feeds the Ashly nXp3.04. The Ashly nXp3.04 is a lightweight, energy-efficient Class D switching amplifier with four 3000-watt channels and an integrated 4x4 Protea DSP. Three of its amplifier channels power three Community R2 loudspeakers at the scoreboard. The final amplifier channel powers a pair of Community DS5 surface-mount loudspeakers in the press box. Additional aux outputs from the nXp3.04’s DSP section feed a Listen Technologies assistive listening system.